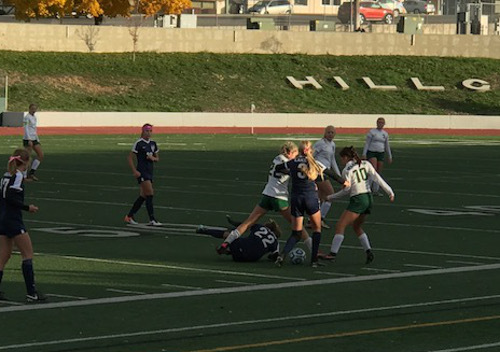 MIDVALE – The Snow Canyon Lady Warriors had their season end abruptly Friday, losing to the Bonneville Lakers 5-4 in a shootout after a 1-1 tie over two overtime periods on in the state 4A semifinals at Hillcrest High School. The loss was an emotional one for both the players and fans. SC has now lost in the semifinals in four consecutive seasons. “I thought we did O.K.,” SC head coach Kenny Kunde said. “I don’t know it was nerves a little bit again today, but I thought that some of the things we worked on were just a little bit off. We weren’t finding that space that we’ve been working on in practice. It could have been a little bit cold for the kids. 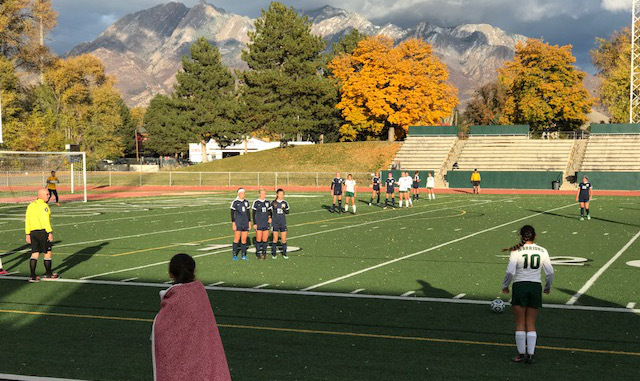 The temperature at game time was 45 degrees, more than 25 degrees cooler than Snow Canyon is used to playing in on an autumn day in St. George. Fans on both sides were dressed in several layers. Players, on the other hand, had to resort to shared blankets on the sidelines to keep warm when not playing. 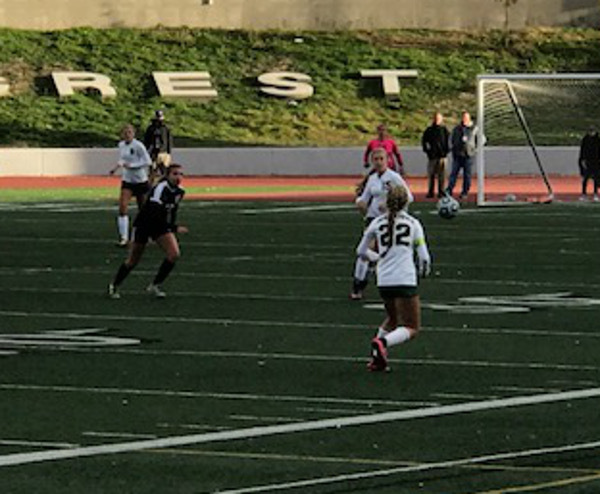 The weather seemed to take a toll on the Lady Warriors’ playing style as they were only able to pull off one shot, a free kick from Arantxa Melendez in the 25th minute, in the first half. 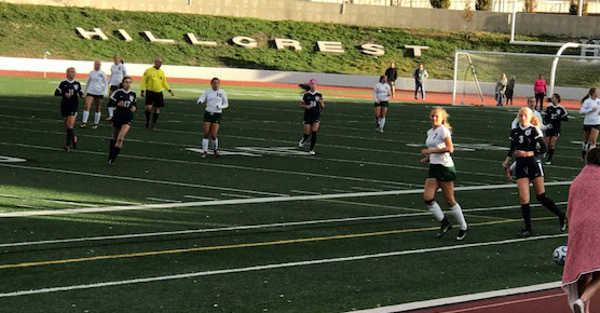 Goalie Megan Rodgers had her hands full in the first half as the Lakers reeled off seven shots, with four of them saved by Rodgers near the goal. One of those saves came only inches away from a Lakers goal in the 18th minute, but was batted just over the crossbar. Despite being outplayed in the first half, the Lady Warriors kept the scoreboard blank as the teams went into halftime. The Lady Warriors had trouble coming out of the second in this game, however. 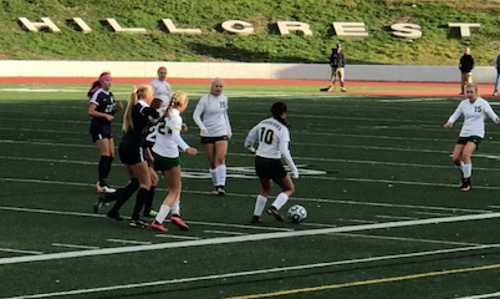 During the 41st minute, the Lakers found a hole in the defense, and punched in a goal past Rodgers to give them a 1-0 lead. In the 51st minute, Heidi Smith attempted to pass to Ashley Brindley inside the box, but a miscommunication led to a turnover. The opportunity, however, seemed to light a new fire for the Lady Warriors. The team had enough heat to ignore the cold weather. 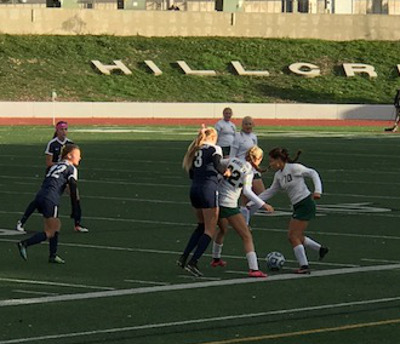 In the 54th minute, Tylei Jensen took the ball from 25 yards out and put a high arch on her shot. The ball was able to sneak past the Lakers’ goalie for the equalizer. “After that goal, I thought their energy levels picked up a bit.” Kunde said. 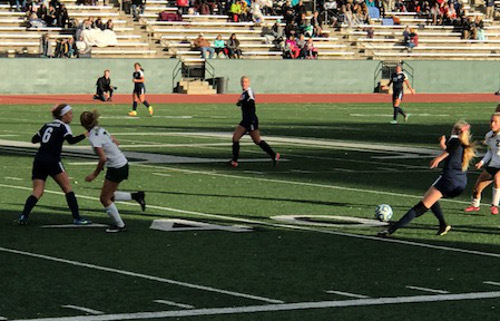 The Lady Warriors avoided disaster in the 57th minute after junior defender Samantha Lindsey was called for a foul. The ensuing Lakers free kick went just right of the goal. Later, in the 64th minute, the Lakers had another shot go off to the right after what most fans said was a missed offsides call. The teams would go into overtime, but were unable to produce any good looks in the first period. 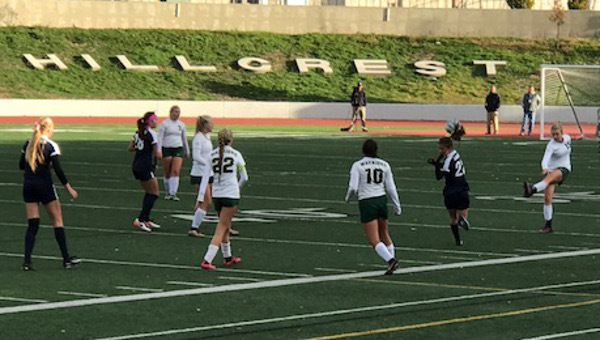 During the 98th minute, in the second overtime, the Lakers had a chance to score on a break, but did not get rid of the ball soon enough. 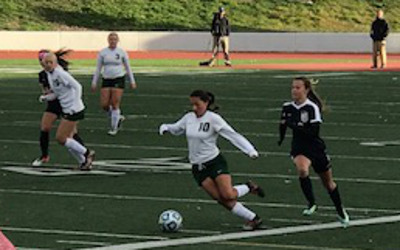 The Lady Warriors held on for the final two minutes and the game went into a shootout. Both teams were confident going into the shootout as they had both won on shootouts last week in the quarterfinals. The Lady Warriors had Kira Boettcher, Brindley, Melendez, Jaci Mooring and Smith take the initial PKs. Only Brindley was unable to connect on her shot, which sailed just inches past the left post. The Lakers also hit four shots, sending the game into alternating shots where the first stop would win. Brielle Hoskins took the next shot for the Lady Warriors, but the ball was stuffed just before the line. The Lakers would make their next shot, sending them to the state finals, while Snow Canyon would have to settle for another semifinal loss. The emotion of the loss was felt throughout the Lady Warriors side of the field. Players could be seen with the faces hidden in their hands, while fans had a look of disbelief in their eyes. Kunde’s players took the loss hard, as tears were seen in each players’ eyes, but knew they had to rebound for next year. “This will get us fired up for next year,” Smith said. “This year, we wanted (to win) even more than we did last year. Megan (Rodgers) is a great keeper. It’s unlucky for that to happen to her because she is so good. “Things like this are opportunities to learn and grow,” Lindsey said. “I’m just excited to get back with my team and get back on the right track for next season. It’s not Megan’s fault at all. She did the best she could and she got us here. A little mistake is not her fault. She should be proud of getting us all the way here. Senior Grace Call, who played in her final game in an SC uniform, had some advice of her own for the team next year. The Lady Warriors finish the season at 12-5-1. Call, Boettcher, Mooring, Hoskins, Mikelle Brooks, Samantha Connor, Sarah Evans and Alivia Hinton will all be gone next year. A majority of the players played key minutes for SC. However, the Lady Warriors will be returning many key players such as: Smith, Brindley, Lindsey, Melendez, Rodgers, Jensen, Sekada Burchinal and Rachel Bunting. Brindley and Smith led the team in scoring this year, while Melendez ran the offense with finesse. Lindsey will be a key defender for the Lady Warriors to take the next step and reach the state finals for the first time since 2012. With the Lady Warriors’ loss, all Region 9 teams have been eliminated from the playoffs. 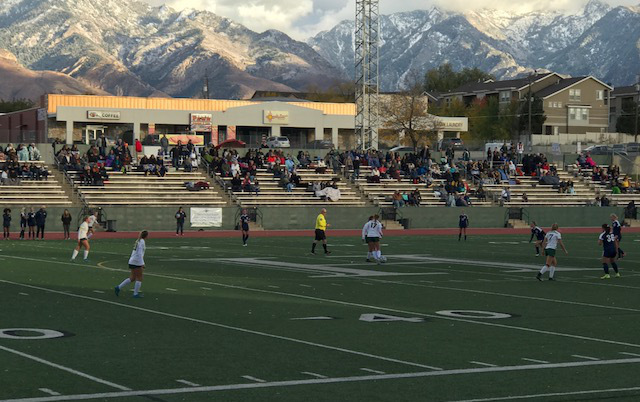 Sky View defeated Ogden 5-0 in the other 4A semifinal, setting up a 4A state championship game between the Bobcats and Lakers Saturday morning at 11 a.m.